Have you listened to Songs of Experience? The first question we want to look at was have you listened to U2’s new album, Songs of Experience. 95.7% of the respondents replied with “Multiple Times”, 2.6% replied with “Once or twice” and 1.7% replied with “Bits and pieces of it”. No replies chose the answer “Not yet”, so everyone who took the questions has listened to at least part of the album. Which is good, because it would be difficult to answer some of the questions if you had heard none of the album. The majority of the people taking the survey have listened to the album multiple times, which is to be expected. Have you bought Songs of Experience? So we have a large percentage of people who have listened to the album, and we wanted to know whether or not they had paid for the album, had some sort of streaming in use, or if they had acquired the album in another manner. Those responding to the survey have paid for a copy of the album, whether a physical copy or a digital copy, and 86.4% said “Yes, I purchased the album in at least one format.” Another 9.5% of you are streaming the album using some method of streaming. 7.5% of you report that you are streaming the album on a paid service, and 2.0% of you are streaming the album on an unpaid service. 4.1% of the respondents answered “no, I obtained the album in another way”. The bulk of those responding are still buying a copy of the album to keep rather than choosing just to stream these things on networks like Apple or Spotify. What format of Songs of Experience did you buy? So what format of the album did you buy if you bought the album? 14.7% of respondents bought the album on vinyl. 10.7% bought the regular 5-Inch CD without the bonus tracks. 39.5% bought the deluxe 5-inch CD with the extra bonus tracks. 5.2% bought the deluxe 5-inch CD from Japan which included an extra bonus track. 27.8% bought the deluxe box set with the deluxe CD and vinyl. 19.4% opted for the digital download. With this album, when you bought a ticket on the first leg for the Experience and Innocence tour you automatically were eligible to either download or receive a copy of the physical regular CD without bonus tracks. Not everyone who bought the tickets would have redeemed this option, so it was possible to buy a ticket and not get a copy of the album. 7.4% of you told us you bought the album as a digital download with your concert ticket. 27.8% of you told us you bought the regular 5-inch CD with your concert ticket. It appears that the physical format was more popular with the tickets with those who read our site. Finally 8.3% of those answering the question told us you had not bought the album in any format. What do you think of Songs of Experience so far? The next question is “So far what do you think of the album?” and the overwhelming response here was positive. 93.7% of the response was positive with those answers split between “Enjoying it very much” (65%) and “Enjoying it” (28.7%). 3.7% of those taking the questions responded “no real opinion either way yet” answering neither negative or positive. We did have a handful of negative responses, with 2.7% choosing a negative reaction to the album. 2.2% chose “not enjoying it” and a further 0.5% chose “really dislike the album.” Over all though the response to the album is favorable among those who answered our questions. How does Songs of Experience compare to U2’s other albums? 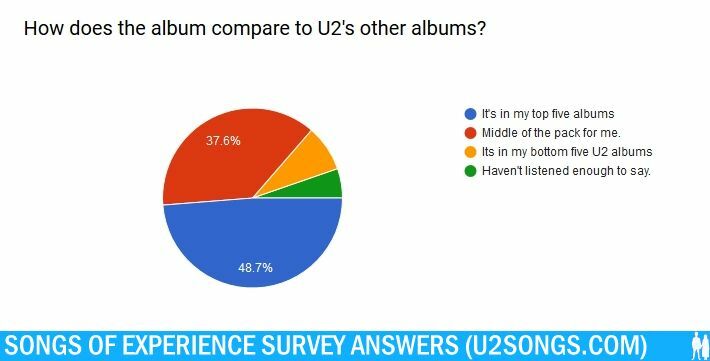 We did want to know how readers were ranking the album in comparison to U2’s other albums after a month of listening to Songs of Experience. We gave listeners an out if they had not felt they had enough time to answer this question by allowing an answer of “haven’t listened enough to say” and 5.3% of those answering chose this answer. But the rest of those answering were willing to share where they thought the album ranked against other U2 albums. 48.7% felt that the album was in the top five albums U2 had released. 37.6% said the album fell somewhere in the middle of the pack when it came to U2 albums. And 8.4% said that the album would fall in their bottom five favorite albums if ranking U2 albums. Almost half of you were wiling to say the album was in your top five albums after just a month of listening. Don’t worry, we will follow up down the road to see how it has aged. Expect us to ask that again at a later date! Which do you prefer? Songs of Experience or Songs of Innocence? The album Songs of Experience is a sister album to 2014’s Songs of Innocence, so it is hard not to compare the two. 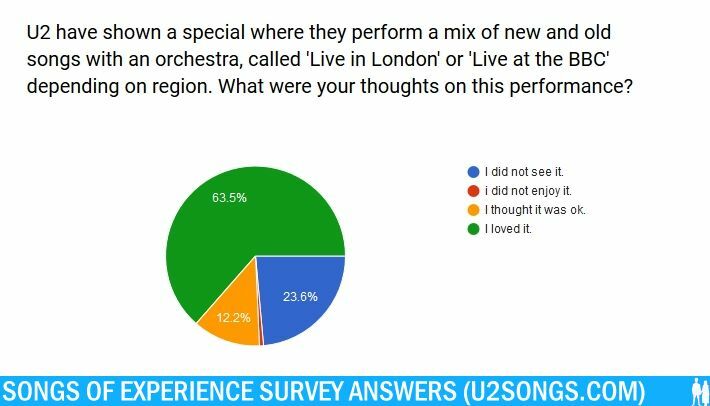 We asked which album participants were enjoying more after a month of listening to Songs of Experience and having had three years to live with Songs of Innocence. 30.3% of you chose that you enjoy both equally, and 4.5% of you want more time to listen to the new album and answered “haven’t listened enough to say”. But 54.8% of people answering the questions did have a favorite, and chose Songs of Experience. Only 10.4% who had a favorite chose Songs of Innocence. At this point in time it appears that Songs of Experience is the favorite. Which guest voice on Songs of Experience did you enjoy the most? The Songs of Experience album has a lot of vocals from other artists mixed throughout, something that doesn’t happen often on U2 albums. Kendrick Lamar appears with a spoken word piece on “Get Out of Your Own Way” and “American Soul”. Lady Gaga can be heard in the background of “Summer of Love”. The group Haim appears on backing vocals for “Lights of Home” and the song even borrows from one of their songs. Julian Lennon appears in the backing vocals for the song “Red Flag Day” and Andy Barlow and Ryan Tedder, both who worked on production of the album, also appear on backing vocals. Ryan Tedder (most known for his work with OneRepublic) appears on “Get Out of Your Own Way”, “Red Flag Day”, “The Showman” and “Summer of Love”. Andy Barlow (most known for his work with Lamb) appears on “Book of Your Heart” one of the bonus tracks on the album. The clear favorite here among those answering? Kendrick Lamar who received 32.5% of the vote. Perhaps it is no surprise as it is the most clearly heard added vocal on the album, and can be heard on two songs that were used in promotion before the album was released. Lady Gaga finished with 20.5%, Julian Lennon with 14.1%, Ryan Tedder with 13.3%, Haim came in with 12.9%, and Andy Barlow came in at 6.7%, but with a song that was only available on the deluxe edition of the album. What streaming bonus did you enjoy the most? Along with the album, a number of bonus items were released on different streaming services. Hope someone is paying attention to how many of us actually like to buy things, rather than just stream them in the above questions, but this is a question about those things that did stream. We asked what your favorite was between a choice of different options. Spotify’s “Singles” where U2 performs “Little Things” and a cover of “What’s Going On” lead the pack with 24.6% of the vote. Apple Music’s “Liner Notes” where Bono reads the liner notes with video and remixes of songs came in second with 23.9% of the vote. Amazon Music’s 6 Hour “The U2 Experience” featuring interviews and exclusive live track came in third with 8.2% of the vote. Spotify’s “Making of” Videos came in fourth with 4.7% of the vote. We allowed the option of “I don’t have a favorite” and 11.9% of you picked that option. Perhaps surprising was how many people had not seen any of these, 26.7% of those taking the questions did not see any of these items. Wondering now if it was disinterest, or not knowing about all these exclusives scattered around the internet. The “Liner Notes” video, perhaps my own personal favorite, has now been launched on YouTube if you do want to check it out. Which throw back to Songs of Innocence did you enjoy most? There’s many moments on this album where previous work is mentioned or alluded to. We chose to avoid some of the less direct mentions, like the lyrics about waves that harken back to “Every Breaking Wave”. But three songs have direct references to Songs of Innocence in the lyrics. Some of the lyrics from “Iris” have been borrowed for “Lights of Home”. Some of the lyrics from “Song for Someone” appear in “13”. And some of the lyrics from “Volcano” reappear in “American Soul”. We asked what of the three was your favorite, and the overwhelming favorite was “Song for Someone” / “13” at 54.9%, followed by “Iris” / “Lights of Home” at 31.6%, and at the back is the “Volcano” / “American Soul” combo, with 13.5% of the vote. “American Soul” spent a lot of time in the lead of the least favorite song question, and finally finished second in that question, so perhaps these results are not a surprise. What did you think of the television special “Live in London” / “Live at the BBC”? Another bonus was a televised concert filmed at the Abbey Road Studios in London featuring U2 and an orchestra performing a mix of new and old songs. The special has aired in a number of countries at this point including Canada, France, Spain, UK, Australia and Ireland among others. As of yet the special has not aired on American television. We asked about the special, and 23.6% of you said you had not seen it. Of the remaining answers, 63.5% saw it and “loved it”, 12.2% saw it and “thought it was ok” and 0.7% of you answered that you saw it and did not enjoy it. Seems the reaction was generally positive among those who saw the special, but there was a small number who didn’t enjoy it at all. Would you buy a copy of “Live in London” on home video? 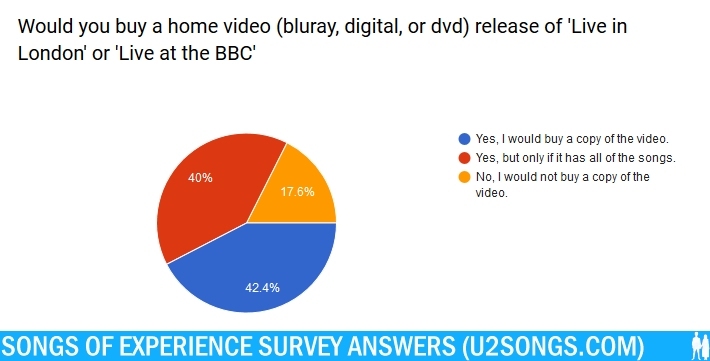 A second question about the live performance at Abbey Road Studios in London asked whether or not you would buy a home video of the performance. Overall 82.4% said you would buy a copy of the video, but of that number 40% clarified that they only wanted to purchase it if it had all of the songs that were performed. (A number of the television broadcasts only presented a small number of the songs.) 17.6% had no interest in purchasing the video. Overall the questions regarding the album seem to be painting the album in a favorable light. People seem to be enjoying the album, and are ranking it quite high when measured against other albums. It is early yet, with just six weeks passing since the album was released at this time, so we shall see if that general happiness with the album continues long term. The questions also revealed that a number of us prefer to buy the album if given the choice (86.4% purchased a physical or a digital copy of the album) and a number of users did not see any of the streaming exclusives (26.7% saw none of these). To us that suggests the fan base that was answering the questions may not be as ready to adopt streaming, or that some of these streaming bonuses were not easily accessible. We also see that our audience not only will buy an album but they will buy multiple formats of the album given a chance. We even had a couple of people who chose every single format listed in the poll question.